A year after the Texas Freedom Caucus first launched, the bloc of hardline conservatives in the Texas House is optimistic it will broaden its membership before state lawmakers head back to Austin in 2019. A feisty coalition of hardline conservatives is looking to grow its ranks with March’s Republican primaries. And to hear some Texas House Freedom Caucus members tell it, that growth is all but guaranteed. “I am certain the Texas Freedom Caucus will grow,” said the group’s chairman, Tyler Republican Matt Schaefer. “A larger Texas Freedom Caucus is a safe bet." Schaefer wouldn’t speculate on specific races or give any clear predictions on size. But others, including state Rep. Matt Rinaldi of Irving, think the caucus could more than double in size in 2019. There are risks, however, as some current members of the caucus face tough re-election battles this year. If those were to go badly, the group's size might actually shrink. Rinaldi pointed to a number of open-seat races where Freedom Caucus hopefuls could prevail. The nascent caucus launched at the start of the 2017 legislative session last January to advocate for a range of conservative issues including private school subsidies, anti-abortion measures and regulating bathroom use for transgender Texans. Most of its members were in their first or second terms in the 150-member House. None were allies of Republican House Speaker Joe Straus, R-San Antonio, although each of them voted for his unanimous re-election in January 2017. They collectively left an unexpectedly large footprint at the Capitol last year. Most notably, the caucus spearheaded the infamous “Mother’s Day Massacre,” a chaotic night in the lower chamber that killed more than 100 bills and thrust long-simmering tensions among House Republicans into the spotlight. Ahead of the next legislative session scheduled to start in January 2019, an increase in the group's membership could have a large and potentially immediate impact. Republicans in the lower chamber may choose next year to vote as a formal bloc in the chamber-wide election to replace the retiring Straus, cutting out Democrats from helping determine the next speaker. As a bloc within that bloc, the Freedom Caucus could have an outsized say in whom the Republicans pick. Middleton, an oil and gas businessman who’s well known among conservative circles thanks to his recent stints on boards like the Austin-based Texas Public Policy Foundation, is challenging state Rep. Wayne Faircloth, R-Galveston. He was endorsed by Gov. Greg Abbott last month. Middleton did not respond to a request for comment for this story. 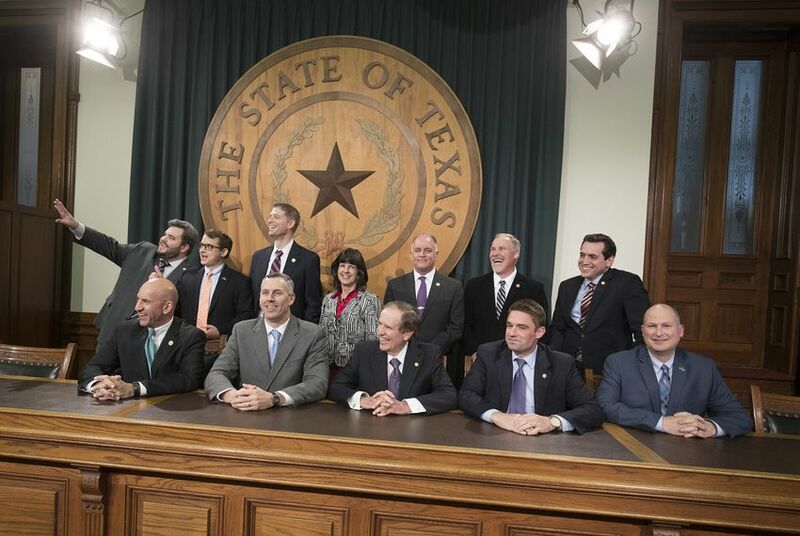 Schaefer said legislators can join the caucus “by invitation only,” after members debate whether new recruits are “committed to furthering the mission of the Texas Freedom Caucus.” Several candidates seem likely to be extended those invitations if they are elected to the House. Chris Fails, the Hollywood Park mayor who’s been backed by Abbott in his primary challenge against state Rep. Lyle Larson, R-San Antonio, said if elected, he’d welcome an invitation to join the caucus in 2019. Bo French, a Fort Worth businessman running for a second time against longtime state Rep. Charlie Geren, R-Fort Worth, a top Straus lieutenant, said he “would absolutely join” the caucus if he’s in the state House next year. Armin Mizani, a Keller City Councilman challenging state Rep. Giovanni Capriglione, R-Southlake, said he’d also be interested in joining the caucus to help push conservative policies. And those are just a few of the candidates being floated as likely additions to the conservative bloc. Caucus members also have their eyes on a number of open-seat races, including House District 13, where state Rep. Leighton Schubert, R-Caldwell, is retiring. Asked at a candidate forum in January which current members of the House she’d align herself with if elected, Jill Wolfskill, a Bellville businesswoman and a candidate in that open-seat race, named some of the caucus’ most outspoken members: state Reps. Briscoe Cain, Jonathan Stickland and Rinaldi. And in a phone interview weeks later, she said she would be “honored” to join their ranks. The Stickland and Cain campaigns each donated $1,000 to Wolfskill’s campaign. She’d be just the second female member of the caucus after state Rep. Valoree Swanson, R-Spring. Wolfskill, who’s engaged in a five-way primary battle, has pulled ahead of her competitors in political contributions and won some valuable endorsements, including that of anti-abortion group Texas Right to Life — and even recruited one of its longtime staffers, Emily Horne, as her campaign director. Former state Rep. Stuart Spitzer, a Kaufman Republican fighting to retake his old seat — currently held by state Rep. Lance Gooden, R-Terrell, who is relinquishing the post to run for Congress — said if elected he’d “absolutely consider” joining the caucus. Stickland’s campaign has given Spitzer $20,000 and Rinaldi gave $500. Thomas McNutt, who’s running again this cycle after losing narrowly in 2016 to retiring incumbent state Rep. Byron Cook, R-Corsicana, said he “shares many of the views of the Texas House Freedom Caucus” and would be “honored” to be considered. McNutt is facing two other primary challengers in that open-seat race — Cody Harris and Linda Timmerman. And Jared Patterson, one of two Republicans running for an open seat in North Texas, said he’d “absolutely” join the caucus if he’s elected. Former state Rep. Steve Toth, who’s running for the seat being vacated by state Rep. Mark Keough, R-The Woodlands, is another candidate who told the Tribune he would be interested in joining the caucus if elected. Several others running in competitive GOP primaries have also drawn speculation as potential Freedom Caucus recruits but did not respond to requests for comment from the Tribune. Still, it’s not clear that all 12 of the caucus’ original caucus members will win their re-election bids. While most members of the caucus appear likely to coast to re-election, at least three are entrenched in competitive primary battles, with two freshman incumbents — state Reps. Kyle Biedermann of Fredericksburg and Mike Lang of Granbury — facing challengers that have been embraced by a motivated public education crowd that has pledged to come out in force for the 2018 elections. Fredericksburg school board member Dave Campbell has emerged as a best bet for toppling a caucus member in March with his bid to unseat Biedermann. Campbell, who announced his candidacy in December and has support from the super-charged public education community, had roughly the same amount of campaign cash in the bank as Biedermann as of the latest round of campaign finance reports. In another race around 200 miles north, Lang is locked in a fierce primary race with Granbury Independent School District superintendent Jim Largent. Largent has called Lang — who has the governor's backing — an absentee legislator; Lang has shot back that his opponent isn’t fully committed to Republican policies. Swanson, a freshman Freedom Caucus member from Spring who has been endorsed by Abbott and U.S. Sen. Ted Cruz, R-Texas, is facing a potentially competitive primary challenge from James Wilson. And while Rinaldi, the Irving Republican, has no primary opponent this spring, he represents a chunk of Dallas County, which went to Democrat Hillary Clinton in the 2016 presidential election. In fact, Clinton beat Donald Trump in Rinaldi's district by nearly 8 percentage points. That makes his chances for re-election less of a sure thing in November compared to other caucus members. Two Democrats – Julie Johnson and Rock Bower – are vying to take Rinaldi on. But Rinaldi remains confident that the caucus’ final headcount and influence will ultimately grow.